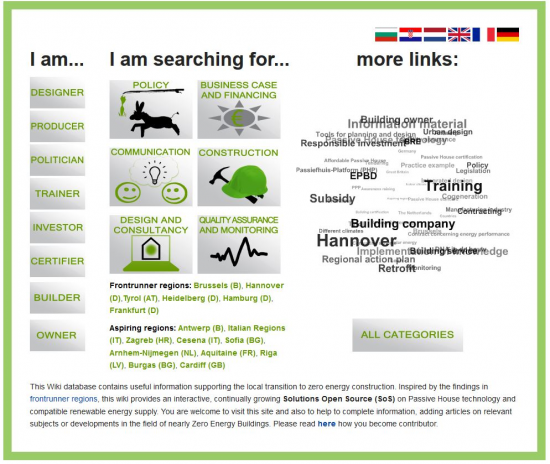 There is a considerable amount of knowledge and experience already available in different European regions such as Tyrol, Hannover and Brussels that have successfully implemented Nearly Zero Energy Building (NZEB) approaches. At the same time, many regions newer to NZEB approaches are quickly developing inspiring solutions and valuable strategies. Within the PassREg project, these successful approaches, methods and tools are being gathered and made accessible for regions and stakeholders throughout the EU and beyond in an open sources wiki, known as the Solutions Open Source (SOS).